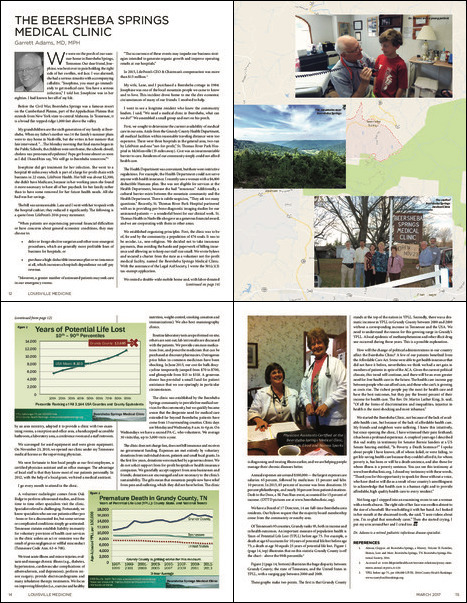 Dr. Garrett Adams recently authored an in-depth article about the Beersheba Springs Medical Clinic which was featured in the March, 2017 issue of Louisville Medicine. The clinic was established by the Beersheba Springs community to provide free medical services for the community, but we quickly became aware that the desperate need for medical care extended far beyond Beersheba; patients have come from 13 surrounding counties. Clinic days are Monday and Wednesday, 8 a.m. to 4 p.m. On Wednesdays we have a second PAC, who volunteers. We average 30 visits/day, up to 3,000 visits a year. The clinic does not charge fees, does not bill insurance and receives no government funding. Expenses are met entirely by voluntary donations from individual donors, patients and small local grants. In the first few years, donations were matched by a generous donor. We do not solicit support from for-proit hospitals or health insurance companies. We gratefully accept support from area businesses and friends; donations are encouraged and are necessary to the clinic’s sustainability. The gifts mean that mountain people now have relief from pain and suffering, which they did not have before. Download and view the full article. This entry was posted in Uncategorized by BSMC. Bookmark the permalink. To learn more about our programs, please listen to this story from Blake Farmer, Senior Health Care Reporter at Nashville's 90.3 WPLN. Read Dr. Garrett Adams speech at the dedication of the “Clinic Cottage” addition to the Beersheba Springs Medical Clinic on October 21, 2018. The Beersheba Springs Medical Clinic is a 501(c)(3) non-profit organization. Tax-deductible donations can be made to the Beersheba Springs Medical Clinic. The fourth annual Dash to the Door was a huge success! 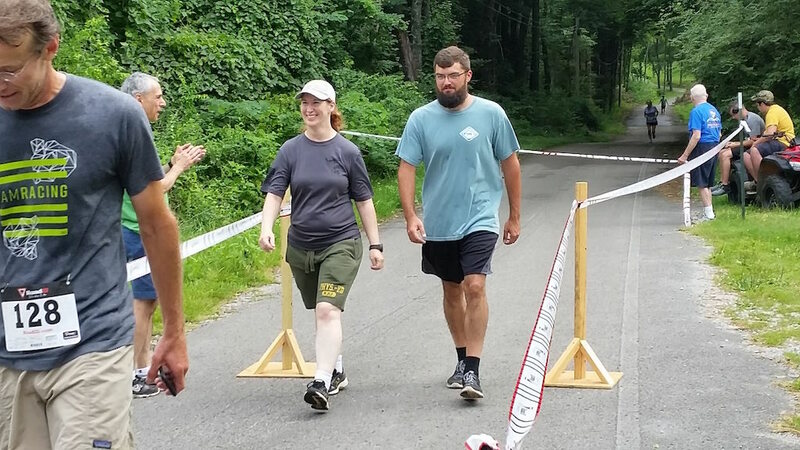 On July 7, 2018, the fourth annual Dash to the Door, a 5K/3-mile Fun Run/Walk, was held to raise funds for the Beersheba Springs Medical Clinic. Over 120 eager runners and walkers gathered for the trip to the Great Stone Door entrance and back. There was a wonderful atmosphere throughout the morning and the event was a huge fund-raising success for the clinic. 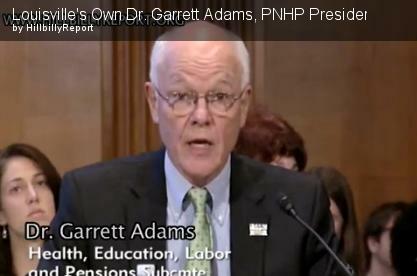 Watch Clinic Founder, Dr. Garrett Adams Testify before the Senate. Copyright © 2019 Beersheba Springs Medical Clinic. All Rights Reserved.